Investing in AIM-listed shares can help you reduce inheritance tax but you have to be picky. Not all shares qualify, and they must be good investments too. As usual, SharePad can help narrow down the field. What is an IHT-exempt portfolio? People with large estates can reduce the inheritance tax bill when they die by investing in companies that qualify for Business Property Relief (BPR). The tax break, which can reduce the value of inherited business assets to zero for inheritance tax purposes, has existed since 1976. Originally BPR was intended to allow family-owned businesses to pass from generation to generation instead of being sold to pay inheritance tax. Since then the tax break has been extended to any investor in unlisted businesses, engineering an opportunity for DIY stock market investors. 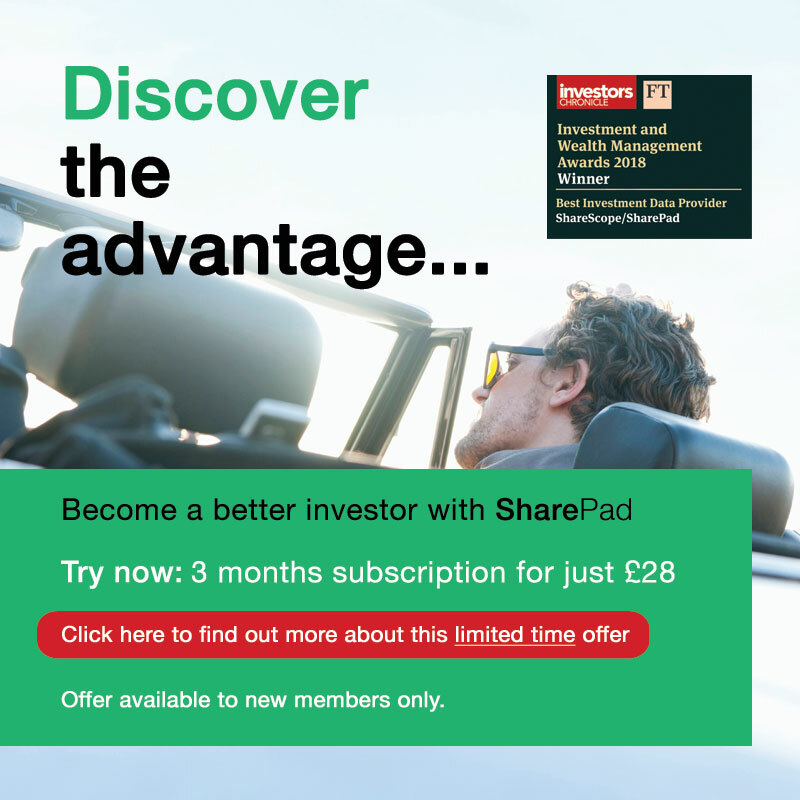 While shares listed on the main market in London do not qualify, BPR can benefit investors in shares because, as far as HM Revenue & Customs is concerned, shares quoted on London’s Alternative Investment Market are unlisted. Most, but not all AIM shares qualify. The most significant hurdle is that the investment must be a trading business rather than investing in other businesses or property. That rules out investment trusts, for example, but could also mean that a business occupying part of its premises while letting out the rest might not qualify in full. There are other traps to look out for too. Companies can be listed on more than one exchange, for example, and if the other exchange is recognised by HMRC, the share won’t qualify for BRP. There is no guarantee that a carefully constructed IHT exempt portfolio will be entirely exempt from the tax. The assets must be held for at least two years to receive the benefit, and in the time since selection, the investments may have changed status. Companies can, for example, move up to the main market, although this is fairly rare, or they may make investments that disqualify them. That said, the most popular and established AIM companies are probably aware of their tax-exempt status and at least wary of upsetting shareholders by taking actions that jeopardise it. One more caveat before we take our first steps towards building an IHT-exempt AIM portfolio. The Office of Tax Simplification has launched a consultation on the inheritance tax system at the behest of the Government, and it is possible AIM’s qualification for BPR will come under review. If in doubt, get professional tax advice, and remember one guiding principle: The tax break isn’t worth having if you buy dud shares. Then we need to consider what kind of share to invest in. We’re unlikely to be interested in short-term trading opportunities because of the minimum two year holding period so we will probably want to pass on stable businesses that will be good long-term investments, rather than forcing trading decisions on our heirs. 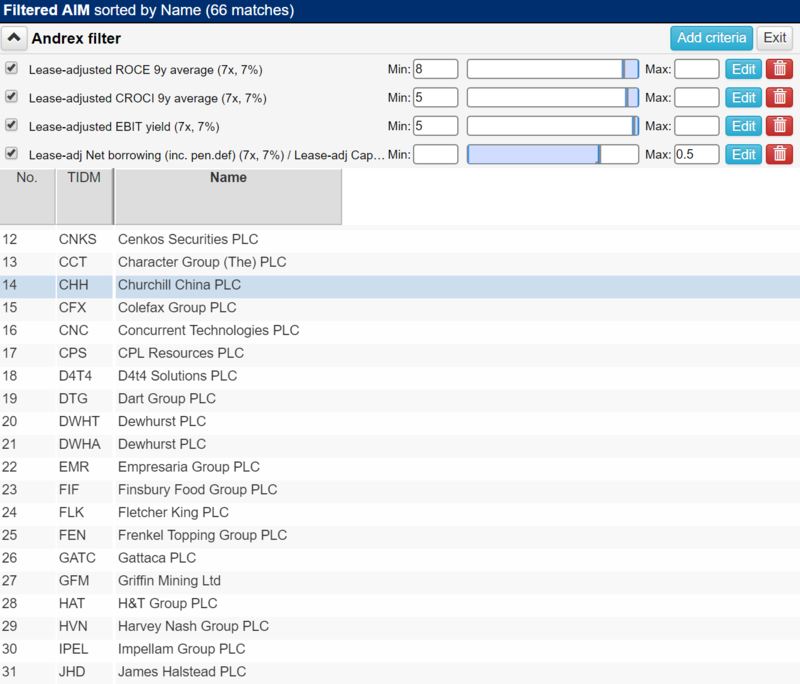 In the following screenshot, I’ve shortened the list of AIM shares in SharePad using my Andrex filter, described in more detail in this article. It’s designed to find strong businesses with a soft share price that I can hold for a long time. The filter reduces the number of AIM shares to investigate from 988 to 66, which is good, but we’ll need to do more, by tightening up the filter criteria, using financial charts, or getting our hands dirty and reading annual reports. However we narrow down the list, the final stage in the process is to find out whether the companies we’d like to invest in are likely to qualify for BPR. This is where we have two choices. We can try to establish whether companies qualify, or we can find someone who has already done the work. Here I’m taking the easy option, because tax bores me, and life is too short to figure out every permutation and consequence of the legislation and read the annual reports to find out if they apply. Investor’s Champion operates a search tool that will, for a fiver, tell you whether, in its opinion, a company qualifies for BPR. For those of us used to screening vast amounts of data for a relatively modest annual fee, five pounds a pop may seem a little steep for one data point about a single company, especially as we will need to check, perhaps every few years, our investments still qualify. But Investor’s Champion gives you more than a straight ‘yes’ or ‘no’. If the decision’s ‘no’ or indeed ‘maybe’, it provides an explanation, which is a fairly painless way of learning more about BPR as it applies to shares. It also offers big discounts for bulk buyers of searches. Commercial and industrial light fitting manufacturer FW Thorpe is one of a group of companies I think of as AIM royalty: long established, often family owned, with handsome records of profitability going back many years. 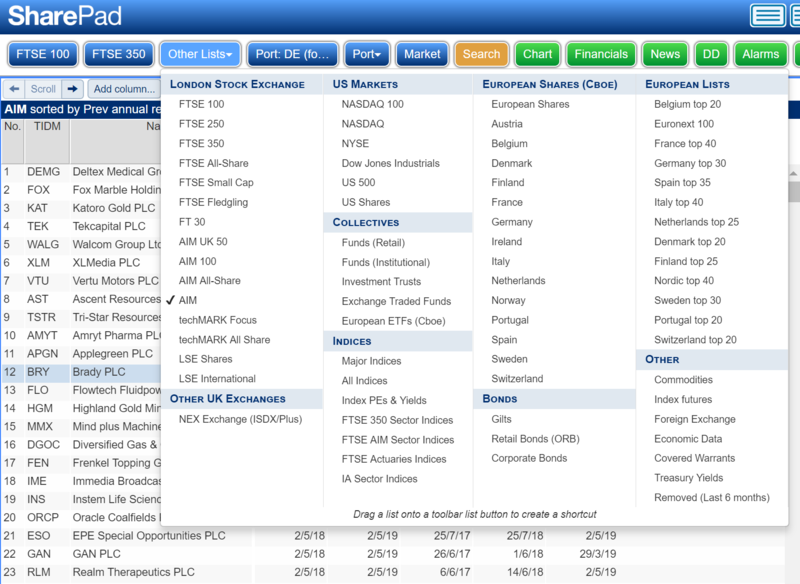 Often these businesses formerly traded on the main market of the London Stock Exchange and moved their listings to AIM. From publicly available information available to us at the time we last updated this information, our research suggests FW Thorpe PLC (TFW) is IHT Qualifying. Other companies I’d categorise as AIM royalty include the world leader in vinyl flooring, manufacturer James Halstead, thriving tableware manufacture Churchill China, Portmeirion, which also makes tableware, and Dewhurst, which makes lift components. These would be among the first companies I’d screen for BPR qualification, if I were to construct an IHT-exempt AIM portfolio. From publicly available information available to us at the time we last updated this information, our research suggests Science Group PLC (SAG) is part qualifying for IHT purposes or unclear due to the nature of activities. Property income from sub-let space in the Group’s Harston Mill facility may result in partial exemption due to excepted assets. While property income for the 2016 financial year was only £1.1m out of £36.9m total revenue, that is clearly nearly all profit implying around 37% contribution to pre-tax profit. Freehold land and buildings at 31st Dec 2016 was a £21.8m component of the Balance Sheet out of net assets of £36m. The £1.1m property income suggests that others are actually occupying a lot of their building. In addition to this the Group has maintained a high cash balance, which was £26m at Dec 2016 year end. While operating cash flow is strong, cash is also being used to buy back shares. We conclude that HMRC could consider there is a significant element of ‘excepted assets’. The company may have obtained tax advice in respect of this, notably as Mr Martyn Ratcliffe is a significant individual shareholder. An example report on the Investor’s Champion site is an outright “no”. Hutchison China Meditech fails because of its dual listing on the Nasdaq stock market.